Mongolia’s journey from ancient empire to socialism and renewal is augmented with beautiful photographs of the country’s wondrous, diverse landscape. In his photo journal, Portraits of Change, a companion piece to a film of the same name, Saha Meyanathan looks at the economic and social strides made in Mongolia after the fall of socialism. The book begins with a brief historical overview, charting the nation’s path from the Stone and Iron Ages to the rise and fall of the empire, the implementation and aftermath of Soviet-imposed socialism, and the emergence of a market economy. Portraits of Change then presents ten cases of entrepreneurial success in democratic Mongolia, as well as the role that XacBank, a microfinance start-up that grew into the fourth largest bank in Mongolia, played in the projects. The success stories are broken up by region, each of which presents geographic and cultural challenges vastly different from the others. One of the “family cases” presented from the mountainous west is Bakhit Jabai, a dombra maker who secured a loan from XacBank to ensure the ancient stringed instrument, so embedded in the region’s culture, would survive for future generations. “Making dombras is my dream,” Bakhit says. “I want to touch every family with my instrument.” From the north comes the story of Gunjmaa Dorjgotov and Gantumur Tsolmon, owners of a profitable sawmill concern. When new environmental regulations put them out of business, the couple purchased two boxes of honeybees. Today, after assistance from XacBank, they own twenty-one boxes of bees and harvest four hundred kilograms of pure honey every summer. “Regardless of the many obstacles in our path, we continue to work hard, and now, finally, we have begun to reap the rewards,” the couple states. With a PhD in development economics from Stanford University, and as the manager for the World Bank in Mongolia for six years, Meyanathan has unique insight into Mongolia’s economic recovery after the fall of the Soviet Union. Beyond being well qualified to tell the story of XacBank, he also possesses the zeal to spread the news of its accomplishments. His writing style is suitably professional while still enthusiastic. 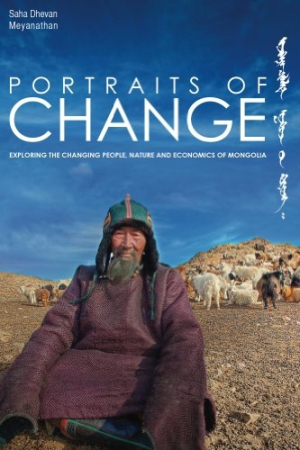 Portraits of Change is augmented by beautiful photographs of Mongolia’s wondrous, diverse landscape, landmarks, cities, and people. The book is thoroughly annotated and provides a detailed index of photographs, a glossary of terms, and a bibliography. Meyanathan has provided a detailed and absorbing account of Mongolia’s rise out of the ashes of socialism and the success of its small, developmentally appropriate entrepreneurial projects. Portraits of Change can serve as an edifying manual for potential project investors or borrowers and as a useful guide for sociologically/environmentally aware visitors and students of the region.